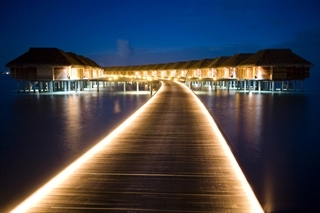 ::(Welcome to Island Pearl Holidays, Maldives - Diva Maldives is located in South Ari Atoll Dhidhoofinolhu and tailor made luxury holidays to hotels worldwide - Diva Maldives is tucked away on the picturesque island of Dhidhoofinolhu in the South Ari Atoll. 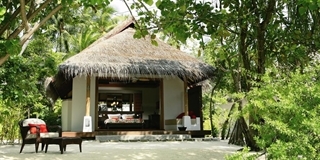 This resort opened in May 2008 and offers luxury facilities in a private island setting. The island itself is nearly 28 acres in area and is accessed by a scenic 35 minute seaplane flight from Male. 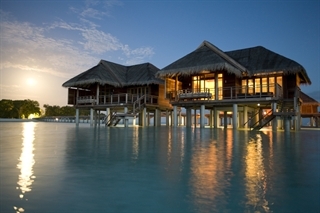 The spacious suites and villas are scattered along the beach with a long walkway leading over the turquoise lagoon to the Water Villas. At Diva Resort, you can immerse yourself in true paradise with palm-fringed beaches, 2 beautiful pools that overlook the sea, a choice of 5 sophisticated restaurants and a luxury spa with 11 beach treatment pavilions. Guests can enjoy a range of activities, including some of the best scuba diving in the Maldives, and children will love the games and activities on offer at the mini-club. 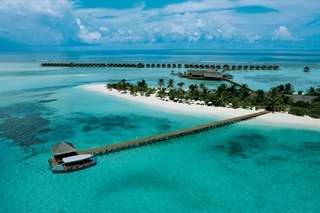 Whether you are seeking a family holiday or a romantic retreat, Diva Maldives offers a luxury holiday experience. * All villas have private and furnished terrace with direct lagoon access * Air conditioning * Bathroom with bath, separate toilet and separate shower * Some villas have private swimming pools * Outdoor shower * Satelite telephone with Direct International Dialling * LCD TV screen with built-in DVD * Mini bar * Safe * Hair-dryer * Magnifying mirror * Complimentary tea and coffee making facilities and a bottle of mineral water * 24-hour room service. 87 Water Villas (80m²); The gentle, shallow waters of the lagoon lap the steps of your exclusive Villa, as you sit reading, sunbathing or taking an outdoor shower in complete privacy, or simply gazing at the wonderful expanse of sea or the neighbouring islands from your own private terrace. Beautiful Maldivian wood flooring, Egyptian cotton sheets and Pierre Frey fabrics from Paris give bedrooms a warm and luxurious feel. The décor has been inspired by the lagoon, with touches of turquoise and shades of beige and ochre, offset by motifs of sea life that bring the ocean setting dramatically to life. The lagoon itself is clearly visible from both the bed and the bath. Each Villa has its own luxurious bathroom with a sunken bath, and the bedroom can sleep two people, as well as a child under 12. A cot can also be provided. Overall, the setting is fantastic, the décor simply stunning and the whole ambiance warm and relaxing. 12 Beach Pool Villas (116 m²); The sunsets from the west-facing Beach Pool Villas are sensational – and there is a view of the lagoon and sunset even from the bed itself. The rooms, with their luxurious en-suite bathrooms, are pure elegance and the extensive use of local wood for the floors and fittings, as well as the Pierre Frey fabrics from Paris, give an added warmth. The décor is subtle and elegant, with sand and ochre colours that echo the beautiful sandy beach, just outside. The individual terrace is more like extended living space, with its wooden decking and a settee for reading, lounging or simply gazing at the lagoon. There is also a table, large enough for meals or for use as a writing desk. Each Villa has a private garden on its far side, featuring a sunken swimming pool with a wooden deck surround, 2 sunloungers and an outdoor shower. There is plenty of room for a cot and there is an overall feeling of spaciousness and a sense of being part of nature. 45 Beach Villas (95m²): The Beach Villas are as attractive as the Beach Pool Villas, with larger gardens but without individual swimming pools. 48 Junior Suites (65m²): All the Junior Suites look out to sea and are near to the sea on both sides, as they are located on the narrow ends of the island. Each Suite has a bedroom, en-suite bathroom, terrace and private garden area. The designer has used dramatic orange touches to give the Suites a warm, sunny feel, further enhanced by the use of local wood for the bedroom floors and terrace decking. Even the stylish bathrooms look out both over the garden and towards the sea. Many of the Suites have communicating doors with the next room and the others have a single bed that can accommodate a child under 12. The resort has a superb range of restaurants and bars, set in stunning locations. SENSES Oriental Restaurant & Lounge Bar; European savours with a touch of oriental spices waft through the air, inspired by North-African, Lebanese, Indian and Indian Ocean cuisines. 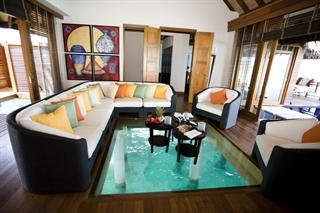 Guests in the Water Villas have exclusive use of the restaurant for breakfast. Thereafter, it is open to all guests, serving salads, grills and seafood at lunchtime, with an a la carte dinner menu. The restaurant leads on to a terrace and an infinity pool, stretching as far as the sea. A lounge bar features a selection of cocktails, rums, liqueurs, beers and international brands of spirits, as well as a selection of famous teas. NOO Restaurant; Noo (which means Blue in Maldivian) is a spectacular, shell-shaped restaurant, featuring international cuisine. The restaurant is by Diva Island Resort and Spa's central beach, serving breakfast, lunch and dinner, with themed evenings. VELI Pool Bar; Veli means Sand in Dhiveli. The bar adjoins the circular swimming pool that extends out to sea, looking out onto the crystal-clear lagoon on three sides. The atmosphere is relaxed and cheerful. Light Mediterranean-style snacks, such as Spanish tapas, mezze and antipasti are served in Véli throughout the day. PURE* Japanese Fusion Restaurant; Standing on stilts over the water, Pure features Japanese-style open cooking. It has a sushi bar and a Tepaniaki table, where the Chef performs a “live” show, displaying all his skills as he prepares their dishes in front of the guests. The restaurant is open evenings only and tables should be reserved in advance. EAST* Asian Restaurant & Bar; This is the resort's main restaurant, standing on stilts over the water, with a wonderful view out over the lagoon. It is open for breakfast, lunch and dinner, featuring, amongst others, Cambodian, Indonesian, Thai, Sri Lankan, Hong Kong and Chinese-style buffets. SEASON* Beach Restaurant & Bar; The beach Bar & Restaurant is located next to the boathouse and opens only at midday. The menu is simple with beach barbecues, seafood brochettes, grills, salads and sandwiches. ALLEGRIA* Italian Restaurant & Bar; Welcome to Diva's Italian restaurant for genuine and traditional Italian cuisine. The concept is again open-kitchen, with large glass windows through which you can see the kitchen staff at work. Allegria features Italian specialities during both lunch and dinner. Exclusive arrangements can also be made for small parties to dine in the setting of the wine cellar, in the heart of the restaurant, with a special menu. It is the chance to indulge in wine and cheese tasting and to learn more about wines and preparing Italian dishes. 2 Infinity swimming pool, Gymnasium / Fitness room, Infinity Spa with 11 Double Treatment rooms, 4 Double Over Water Treatment rooms, Manicure & Pedicure salon, Souvenir Boutique, SIFANI Jewelry Shop, Laundry service, Safe deposit lockers, In-house doctor, First Aid service, Internet access, Baby sitter, International Direct Dialing, Satellite TV / TV room, Beauty Salon, Piano Bar (Private Karaoke), Renewal of Love Ceremonies. Kids Club; Team members are available every day to look after children aged from 3 to 12, from 10.00 to 22.00 A whole range of activities is organised for them, adapted to particular age groups, to make sure they too experience an unforgettable holiday. Children can have lunch at the kids club between 12.00 and 13.00 and dinner between 18.30 and 19.30 Children below 3 years old must be accompanied by a parent or a baby sitter. A baby-sitting service, for which a fee is charged, is also available. Teens Club; The Teens Club is a space where older youngsters can relax and have fun. The Club has a TV, DVD player and games machines. PADI Scuba Diving, Snorkeling, Catamaran Sailing, Windsurfing, Surfing, Banana Boat riding, Canoeing, Wake boarding, Water skiing, Glass bottom boat ride, Kite surfing, Jet ski, Parasailing. Sports and Activities: Island Hopping, Night Fishing, Aerial Excursion, Big Game Fishing, beach volley, table tennis, badminton, floodlit tennis courts, billiards, table football and games machines.